BARBADOS – As Caribbean countries prepare for the 2018 hurricane season, the United States government, through the United States Agency for International Development’s Office of US Foreign Disaster Assistance (USAID/OFDA), is supporting the region’s response capacity as it relates to effective operational management of emergency shelters. 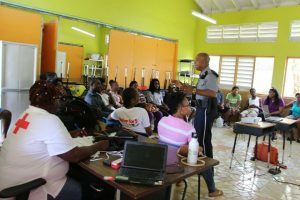 Following requests made by their respective national disaster offices, more than 40 officials from Barbados and St. Lucia recently participated in USAID/OFDA’s two-day Shelters and Shelter Management (SSM) training course. SSM training is requested by countries according to their needs and forms part of USAID/OFDA’s Regional Disaster Assistance Program portfolio. The participants, who are all responsible for managing emergency shelters in times of crisis, included school principals, church representatives, representatives of district disaster committees and representatives from ministries of public works, education, public health and social services. The training exercise featured a combination of classroom activities and simulation exercises, and participants conducted an assessment of a designated shelter in each country to ascertain suitability or readiness should the need arise. Attention was paid to the overall condition of building, lighting/electrical, washroom and bath facilities; running water; and other essentials. As a result, participants will be better able to determine and mobilize resource needs, prepare shelters for use and operate them within budget, select appropriate and alternative structures and establish and maintain effective channels of communication with relevant agencies and support groups. USAID/OFDA supports disaster risk reduction (DRR) programs that save lives, alleviate human suffering, and reduce the social and economic impact of disasters in Latin America and the Caribbean. According to USAID/OFDA regional adviser John Kimbrough, its primary focus in the Caribbean is to enhance local and national self-sufficiency in disaster preparedness and management. The most recent training was held in Barbados May 29-30 in collaboration with the Ministry of Education. It followed a similar exercise held in St. Lucia May 23–25.